note added on 8/04/07: When I saw the topic "green" for this week's Illustration Friday I immediately thought of Ethel - peas and all ! Reminds me of my current favourite children's book, Lauren Childs, 'The Princess and the Pea". Even the collage style. 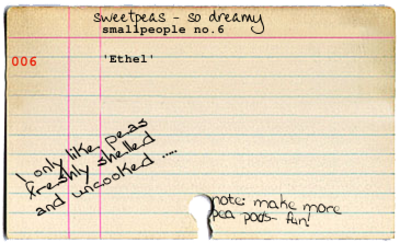 The small people just get better - Ethel has great fashion sense (I love her 'layered look'). she's got some attitude!! :) love it. She made me smile...I hated peas when I was younger and they were always the last thing left on my plate! Gorgeous card! haha thats my little niece...such a fussy eater! they are adorable...any boys coming up? small people do know just what they like...and hate! good for you ethel! stick to your guns! I love her music hair. great concept for the theme. An interesting combination of papers. I like the fact that there are "residues" of their former states of being. Like the music notes in the hair. Really very cool. I used to hate peas too! I think that's because as a kid, I only had them out of a can and straight up. But as an adult, I know how tasty peas can be when fresh peas are quickly blanched, rolled in a lemon-garlic butter sauce, and sprinkled with bits of crispy bacon. Yum! Great picture, love the different textures. 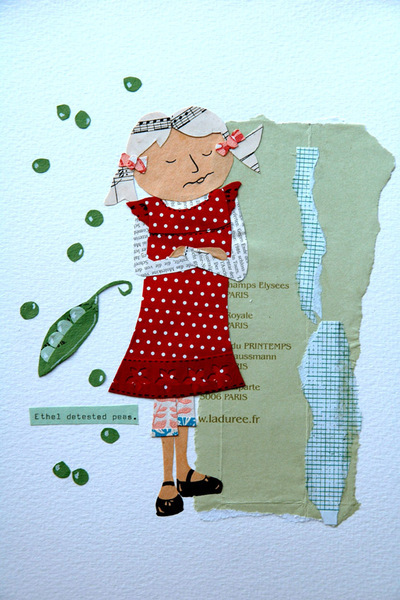 My favorite parts of this piece are her shoes and the peas. I don't know if the library cards are part of a bigger project, but I like the idea very much.